According to Deadline, Jurassic Park 4 is back on and will be written by Rise of the Planet of the Apes hubby-and-wife scribes Rick Jaffa and Amanda Silver. The news comes after Steven Spielberg announced at Comic-Con last year that he'd like to see the movie get made in the next couple years. 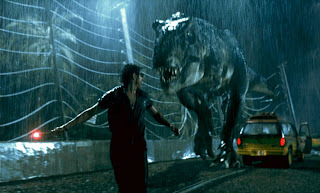 After Apes ended up being a box office success, perhaps Silver and Jaffa can strike gold twice - or at least create something better than the pretty bad JP sequel The Lost World (1997) and the mediocre Jurassic Park III (2001). And let's hope and pray the once-rumored plot of dinos with guns as fourquel fodder has been effectively abandoned. What I like is they still hold up to modern day movies.